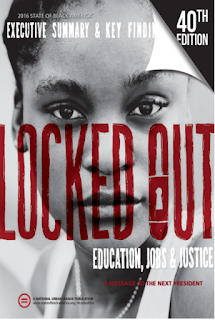 The National Urban League has released the 2016 State of Black America Report, Locked Out, Education, Jobs, and Justice. Since 1976, Black unemployment has consistently remained about twice that of the white rate across time, regardless of education. Black Americans are only slightly less likely today to live in poverty than they were in 1976. Highest median household income for Blacks ($66,151) & whites ($109,460) was in Washington-Arlington-Alexandria, DC-VA-MD-WV area. Toledo, OH had lowest median Black household income ($22,386). White household income low but still more than double Black income. Foreclosure crisis has left Black homeownership rates the same as in 1976, while white homeownership went up 5 percentage points. For Latinos, median household incomes were closest to white household income in Urban Honolulu, HI, at 80 cents for every dollar. There has been some progress: slow, ongoing reduction in poverty. Black poverty rate is 2.4 percentage points lower than in 1976. Despite progress for Black America, there's been much less progress towards economic equality w/whites, especially in education. Gap in civic participation between Blacks and whites has narrowed 7 percentage points since 1976.